With more than 600 images on its walls, most of them engraved, the cave of Combarelles is considered to be one of the major sanctuaries of Magdalenian culture. This extraordinary site was discovered in 1901, and was quickly authenticated by L. Capitan, H. Breuil and D. Peyrony. 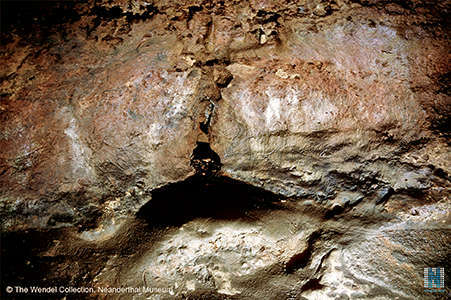 Beyond the entrance of the cave, excavated by Emile Riviere in 1892, two galleries diverge. The largest one, now open to the public, is a narrow and winding passage, following a zig zag pattern for more than 240 metres. The animals represented are finely engraved, or (more rarely) drawn in black outlines. 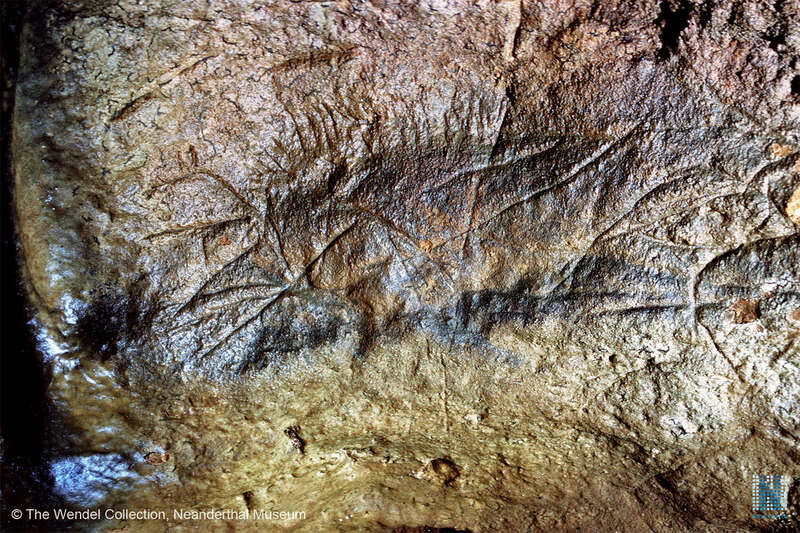 A diverse fauna is represented, including horses, reindeer, ibex, mammoths, rhinoceros, bears, lions and a few bisons and aurochs. The identification of these often superimposed animal engravings is facilitated by their naturalistic style. This naturalism is in contrast to the exceptional assemblage of 52 anthropomorphic figures, which are more schematic, and the occasional signs (mostly tectiforms). 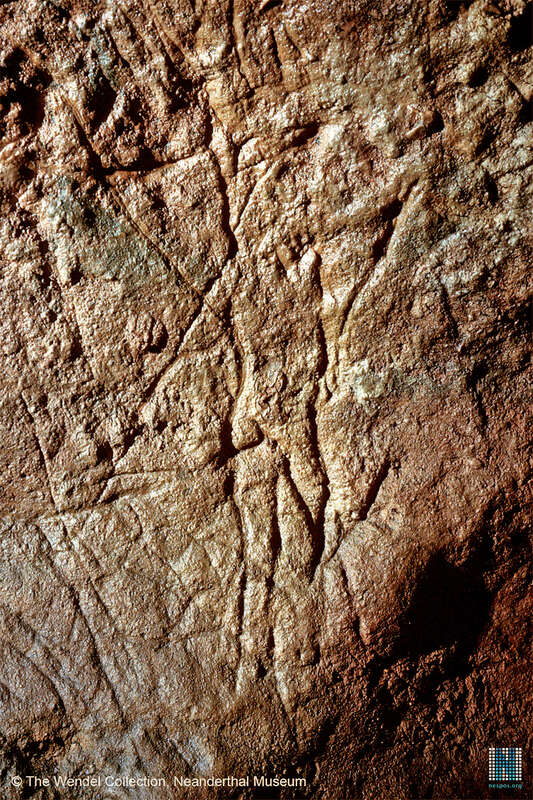 The entire ensemble of images is attributed to the late Magdalenian, about 13 000 years ago. In front of the caves is an old plastered stone farmhouse, nestled under the rock overhang. 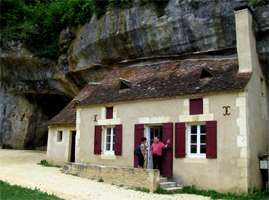 It is by no means the first such dwelling, as can be seen by the lead sheet let into the cliff above it formerly providing weather protection to the roof, from water run off down the cliff, of a larger structure. The farmhouse now provides shelter for tour guides, and a display area. Source: Display in the Les Combarelles reception area. (Left) Entrance to the galleries of Les Combarelles, with Les Combarelles I on the left, and Les Combarelles II on the right. (Right) Locked steel door giving access to tours of the engraved galleries of Les Combarelles I. Les Combarelles II is not open to the public. 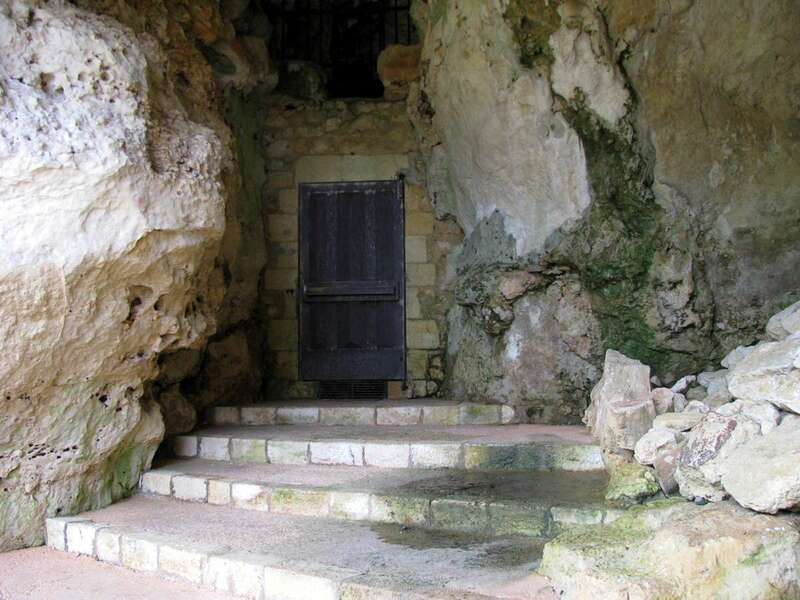 Entrance to Les Combarelles II, not open to the public. Map of sites in the Vézère Valley of France, including les Combarelles. 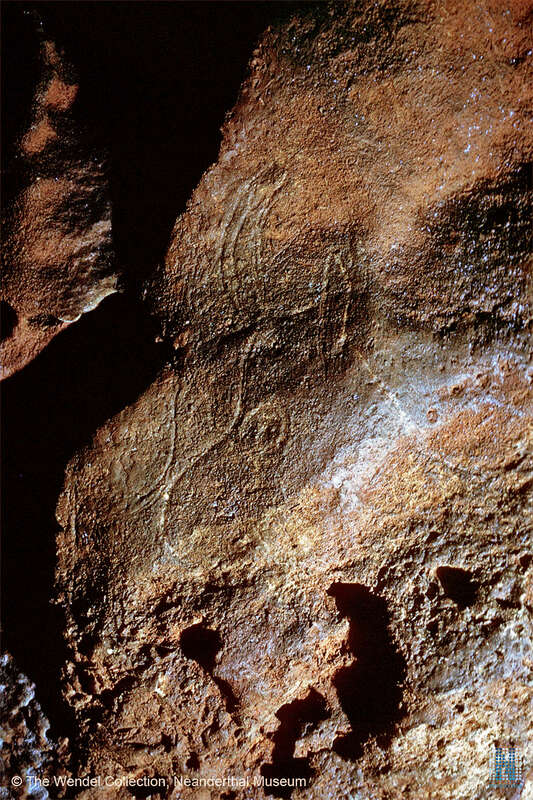 The plan of the images shown in their position in the cave. Note that not all the images are depicted in this schematic view. Plan of Les Combarelles I. This plan uses the numbering of H. Breuil. Drawings of selected engravings from Les Combarelles I.
Engravings from Les Combarelles I.
Grattoir on a blade, unaltered small blades, a blade retouched on one side, and a godet - a small mortar used for grinding ochre. Tools from Les Combarelles - scrapers, burins, awls, and blades of various types. 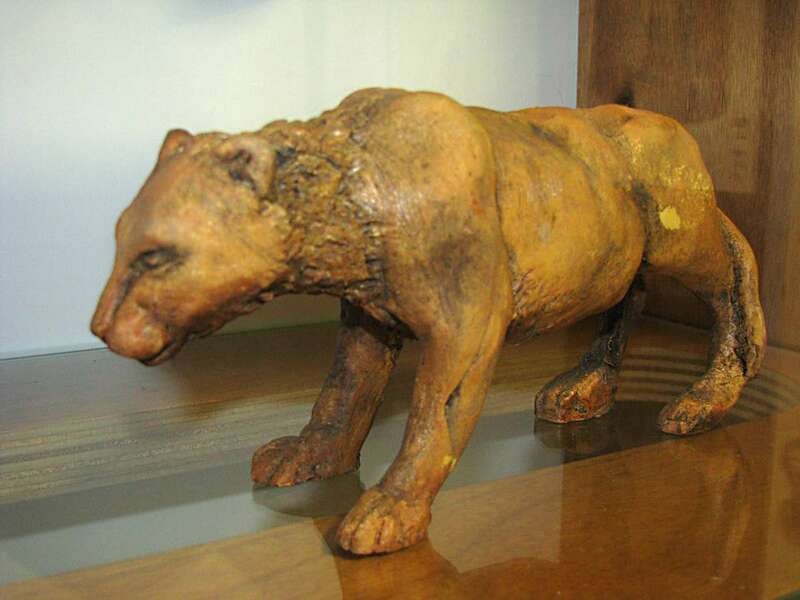 The front of a feline, facing right. It may well be that the back of the animal never existed. This fine engraving shows a round nostril and a well marked mouth. 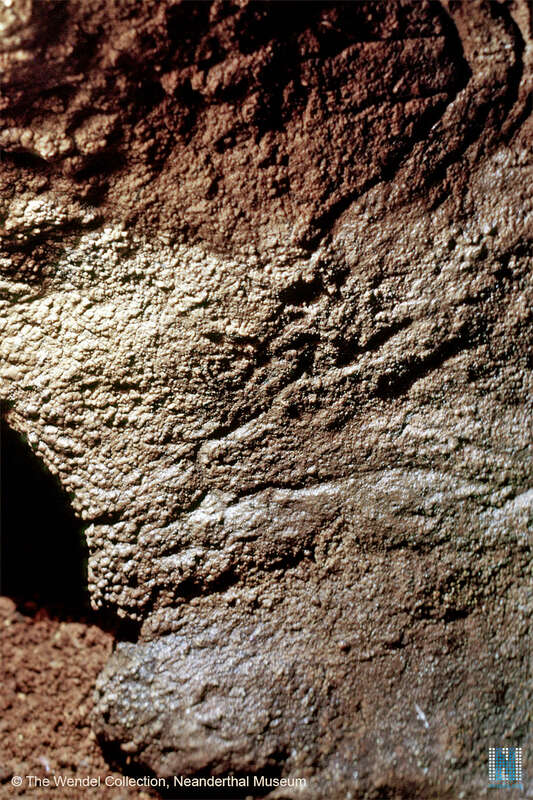 The eye is indicated by a small flat stone. The area has been calcified, and this may well have helped preserve the image. Close up of the feline head. The wall appears to have had subsequent calcification. 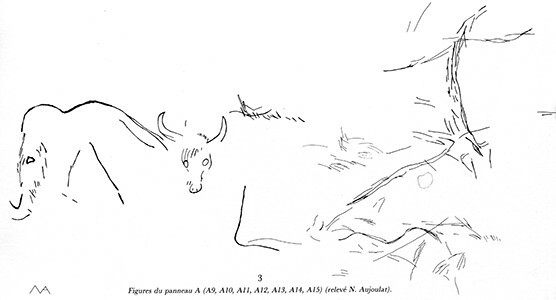 The feline above is labelled as number 52 in the 12 metre long series of drawings by Capitan and Breuil (1902a) (see the rest of these images below). This is an engraving known as 'reindeer drinking', and is one of the best known of the cave. The animal is complete; the back is well marked, the rump is rounded, and the hind legs are marked. The antlers are huge, with wide, fingered webs, bent at right angles to the front. Another version of the reindeer drinking, and a closeup of the head. The engraving of the drinking reindeer on the right, and another which may be of a rhinoceros on the left. 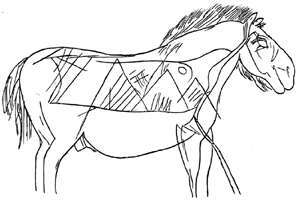 Engraving of a horse, the best represented animal in the engravings. This horse head is beautifully proportioned, by an artist with talent and a lifetime spent studying horses. 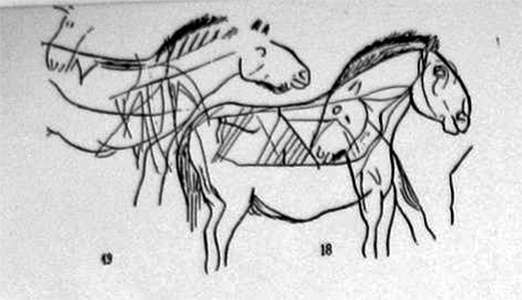 The horse head above is part of the complete horse labelled as number 18 in the 12 metre long series of drawings by Capitan and Breuil (1902a) (see the rest of these images below). Deer with a long neck. 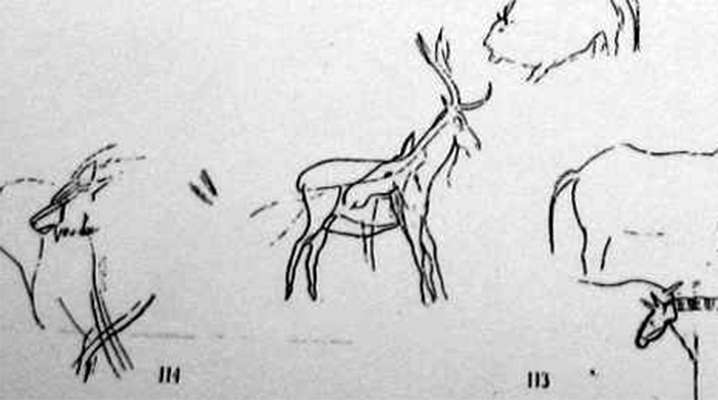 The above deer is labelled as number 113/114 in the 12 metre long series of drawings by Capitan and Breuil (1902a) (see the rest of these images below). The overwhelming impression when in Les Combarelles is how narrow the passages are. 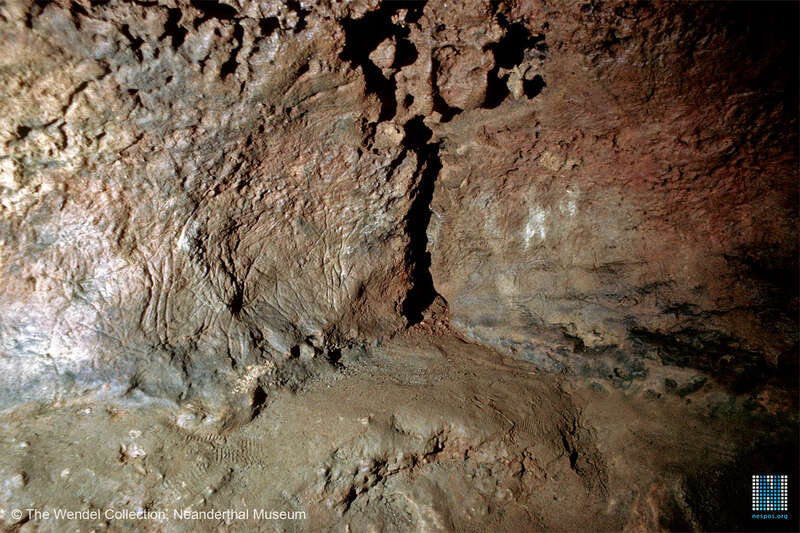 In this photograph we can see the cables on the roof of the cave that are used to supply power for the lights. 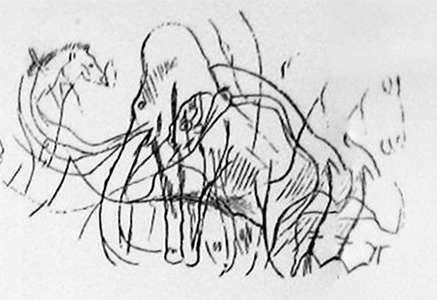 Horse running with a fluid movement, beautifully realised by the artist with just a few lines. This appears to be a cartoon of a human face. 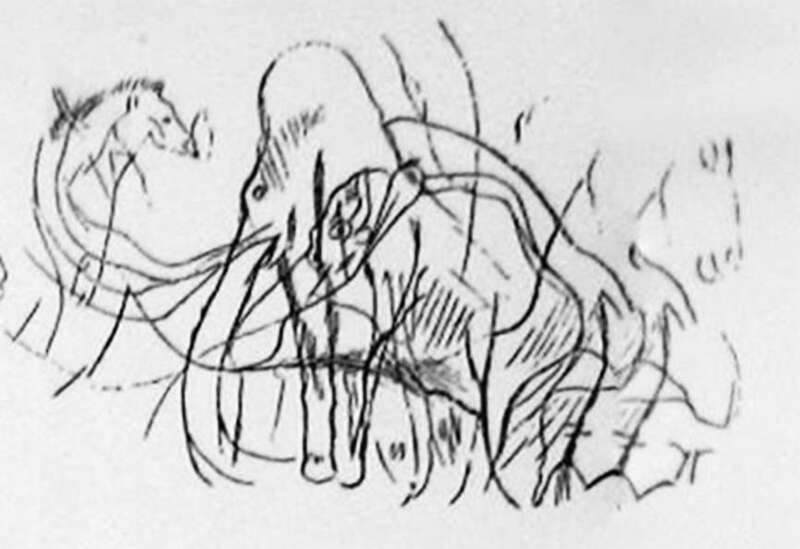 The face above is labelled as number 76 in the 12 metre long series of drawings by Capitan and Breuil (1902a) (see the rest of these images below). 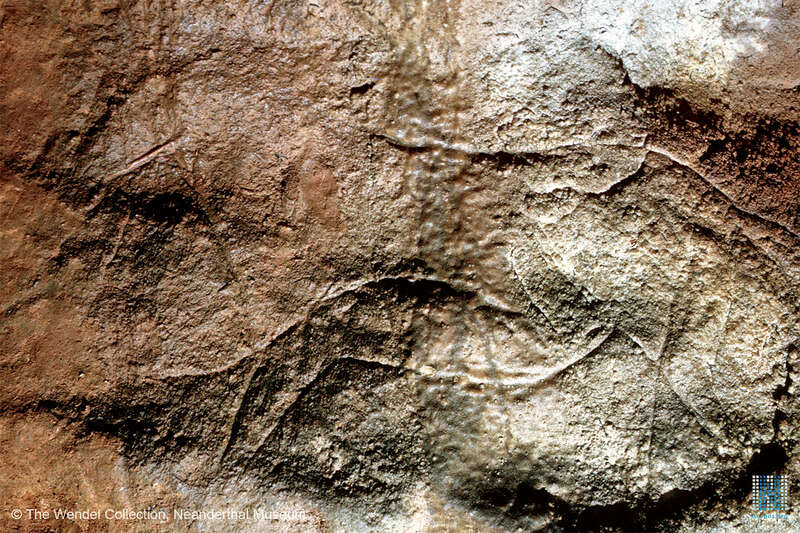 Many of the images in Les Combarelles are enigmatic, but I believe I can see on the right the dorsal and ventral line of a horse or a stag, as well as its front legs. 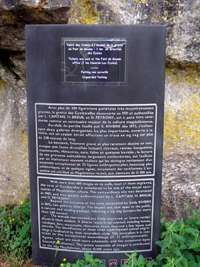 The above image in context. 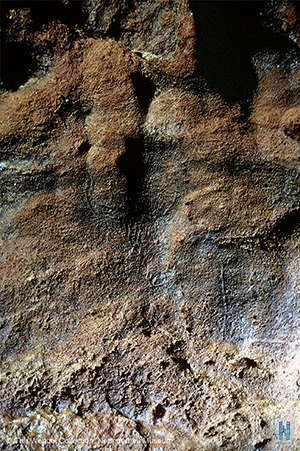 A close up of the right hand side of the image. 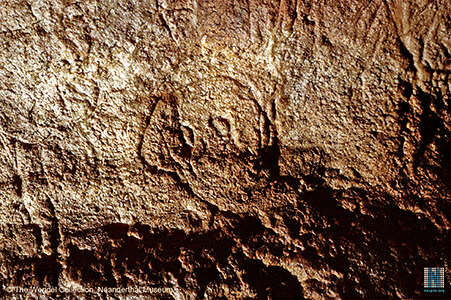 When seen in isolation like this, the engraving could almost be the outline of a human figure. This appears to be the hindquarters of a bison. 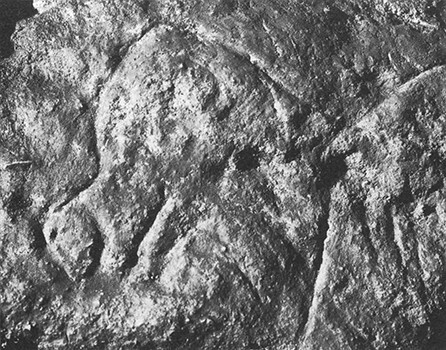 The engraving appears almost moulded into a bas relief in this photograph. 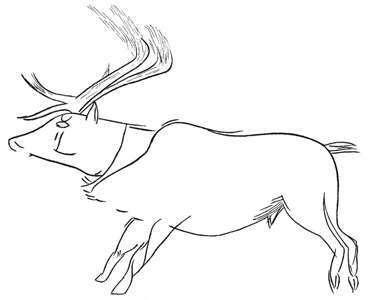 This appears to be an engraving of a deer, yet the tail is more like a horse. 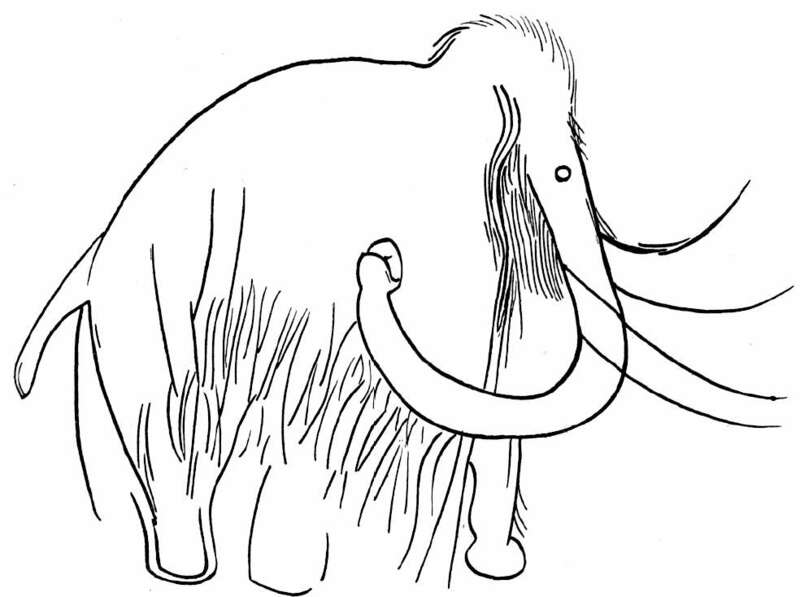 The mammoth above is number 69 in the drawings by Capitan and Breuil (1902a). Photo: Capitan and Breuil (1902a). I cannot recognise an animal in this image. Horse, facing downwards to the left. This is the outline of a cave bear, facing to the left, with head down. There is the head of an unidentifiable animal at centre left in this image. 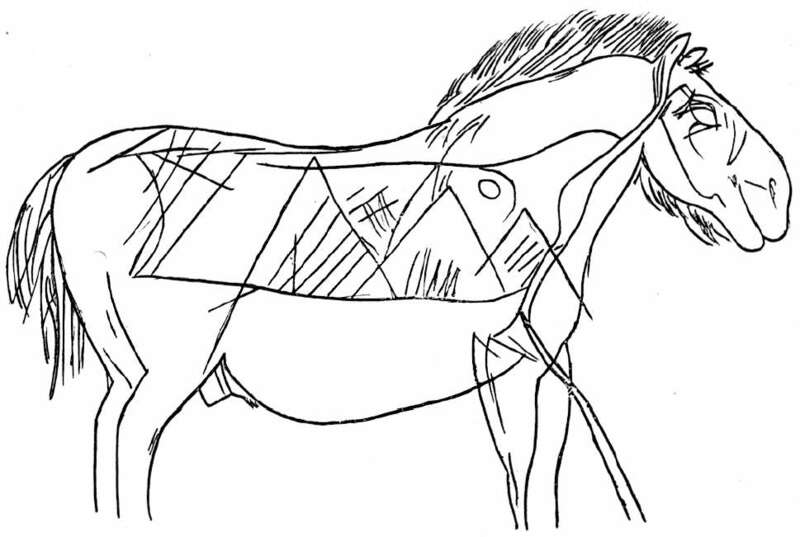 Horse head and front legs. 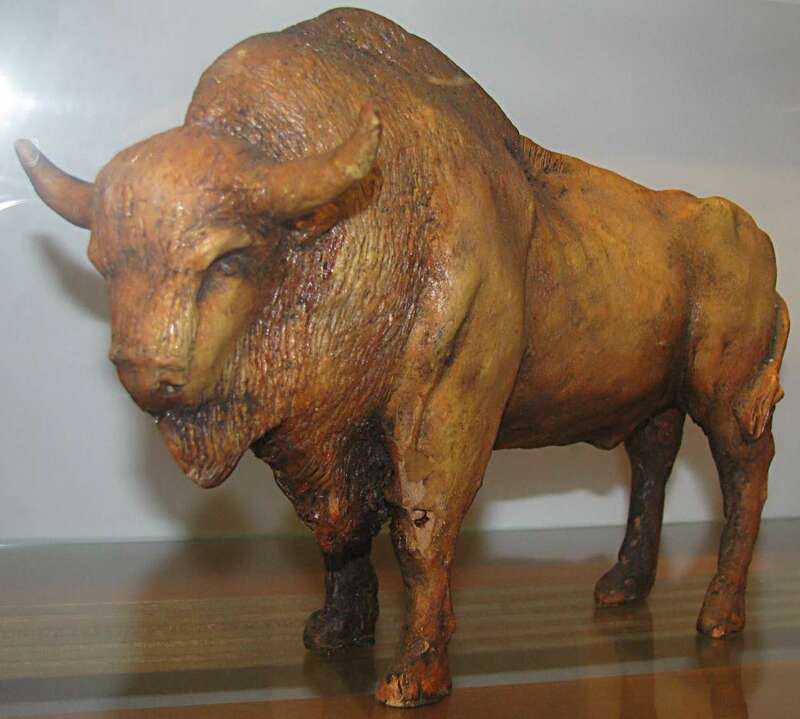 Aurochs head facing to the front. Deer head. The head is quite bulbous or cartoon-like. Facsimile of part of the engraved walls. 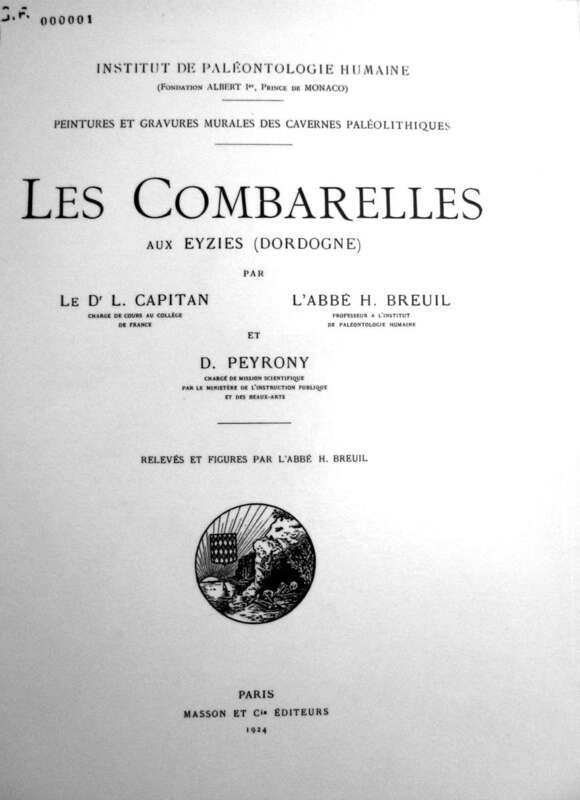 Monograph by Capitan, Breuil and Peyrony on Les Combarelles published in 1924 - by the serial number, the first such copy! These finely made sculptures were in display cases in the reception area of Les Combarelles. I assume they were for sale, and I was impressed with their good proportions and detail. The artist is unknown. 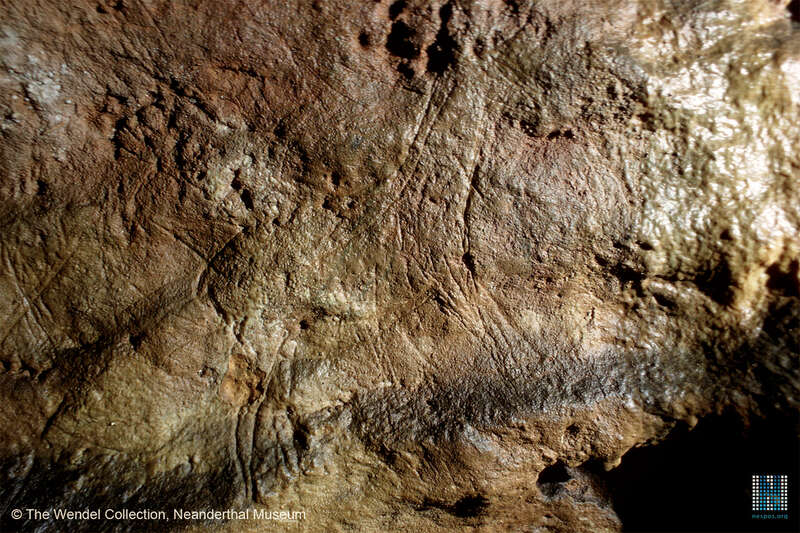 The sculpture of the mammoth is especially valuable because of the inclusion of a human figure at the same scale. 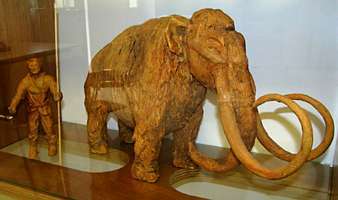 Mammoths were the largest animals of the time in the area. They were smaller than an African elephant, about the same size as an Asian elephant, standing 3 metres high at the shoulder. Nevertheless they would have been a formidable prey to bring down. The meat and fat they carried, as well as their huge and thick hide would have made them very valuable to the people of the time. Bones and ivory could have been scavenged from mammoths which died a natural death. 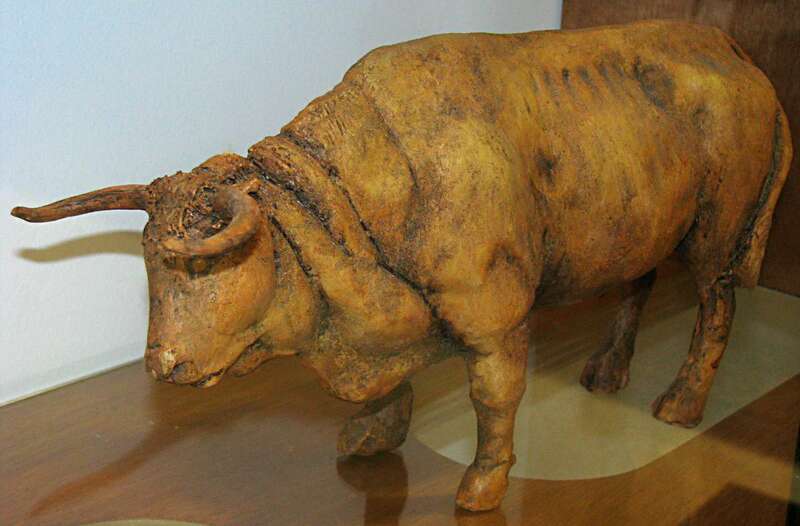 This Aurochs was particularly well fashioned. The Aurochs is the ancestor of modern cattle. Like most of the animals on display here, and depicted on the walls of Les Combarelles, it was a creature of the well grassed open plains and wide valleys, such as the Dordogne region in ice age times. The European Bison, like the Aurochs, were most often in herds, and the hunters would most likely have hunted this quarry in groups. Each species would have required different methods, and even different spears in some cases. 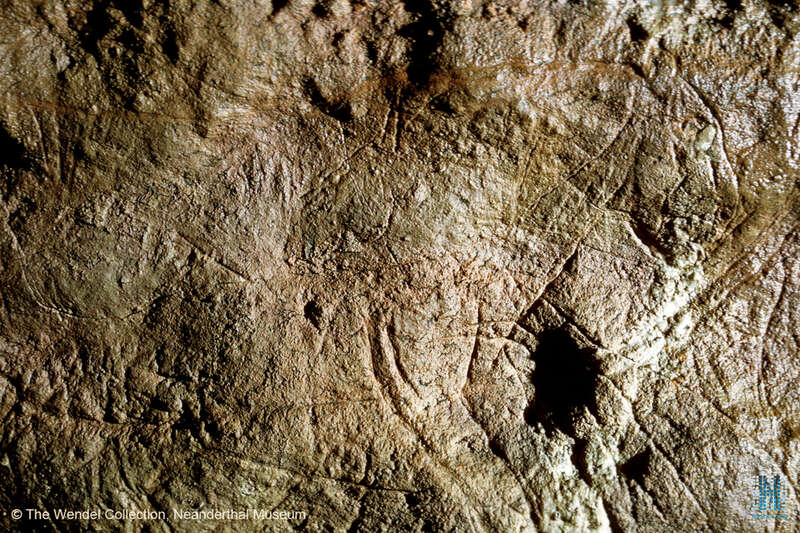 The Cavebear, though nominally vegetarian, would have been a formidable adversary if it was disturbed, or if their young were endangered. 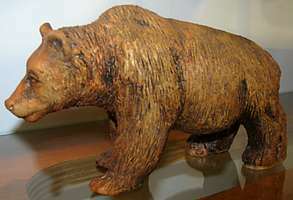 Cavebears may well have been encountered by nomadic hunters returning to caves for ritual or painting purposes, since cavebears overwintered in caves, and there is plenty of evidence of cavebears in the area at the time. 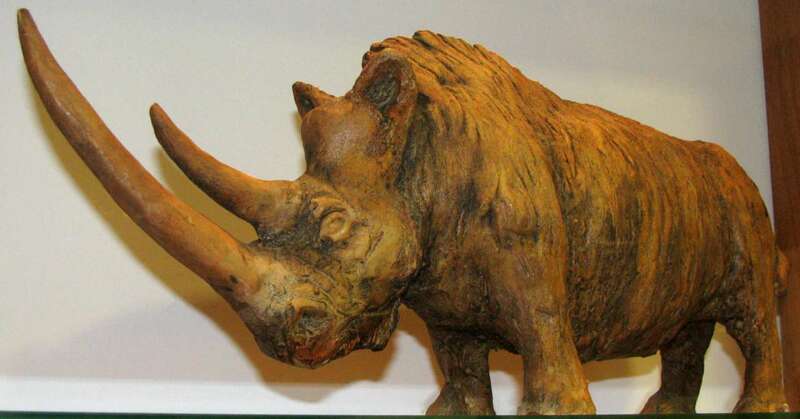 The Wooly Rhinoceros would have been the most dangerous animal of all during those times. Often alone, it was well able to defend itself, and almost certainly had a very aggressive response to any approach by humans. It was probably given a wide berth at all times. 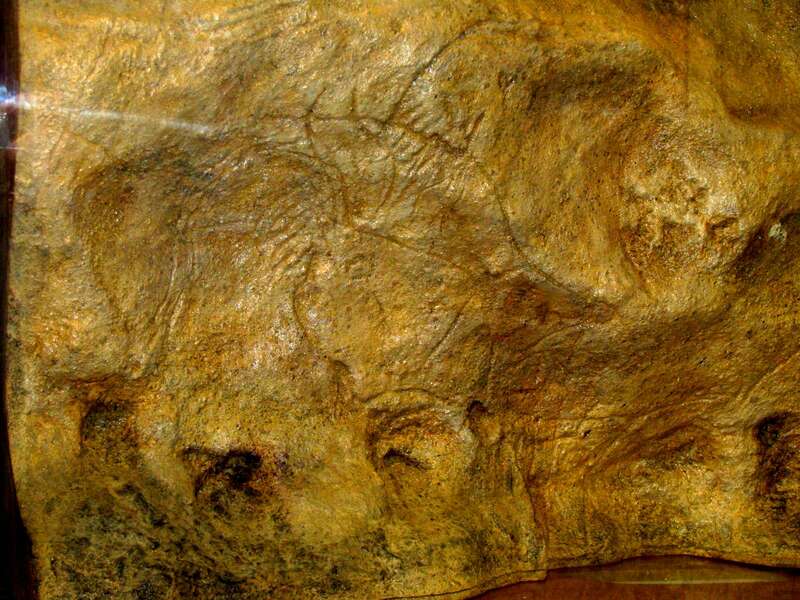 The Cave Lion was a huge animal. It was significantly larger than modern African lions. No doubt it was avoided where at all possible, as it would have regarded humans themselves as prey. 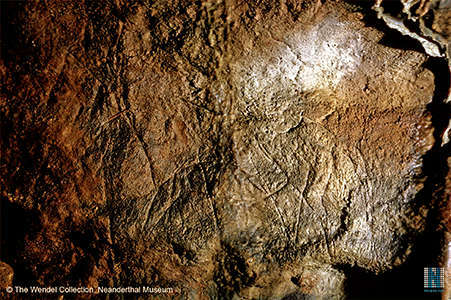 A lone human would have had little chance against a Cave Lion. 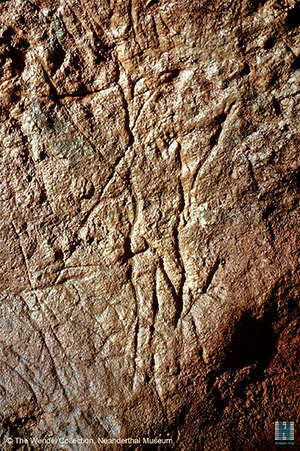 An unpublished engraving from the walls of Les Combarelles. An engraving of a bovid with a mane. A reindeer in full flight. 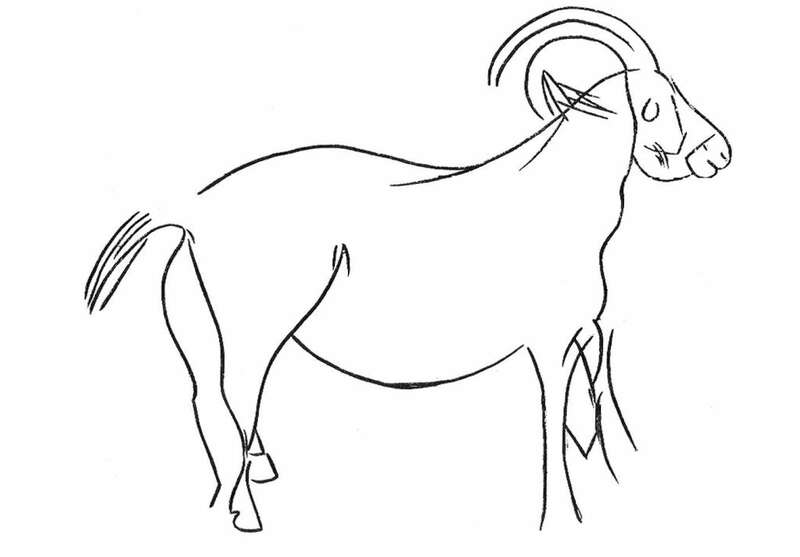 An engraving of an ibex. 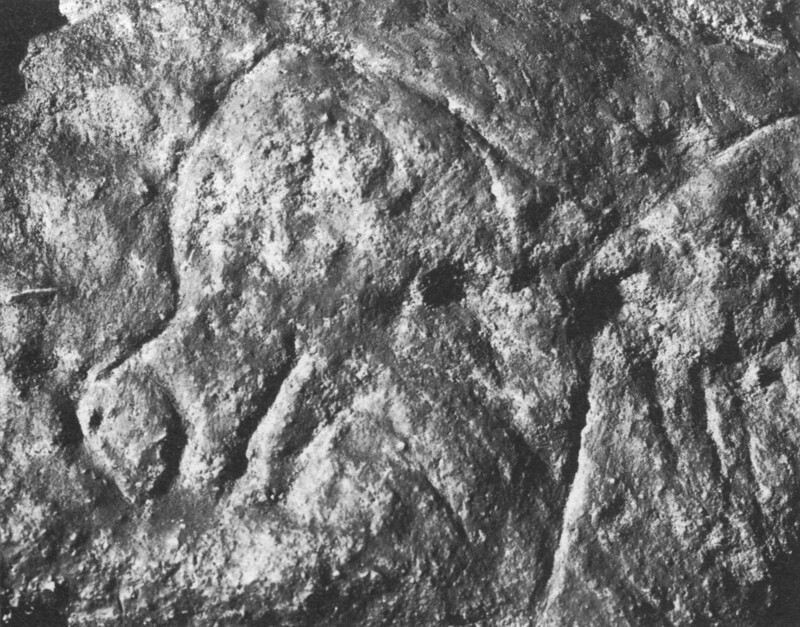 Two tectiform signs symmetrically placed. 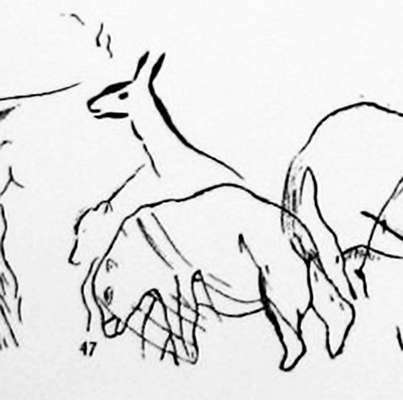 Between them, an engraving of a deer or antelope. 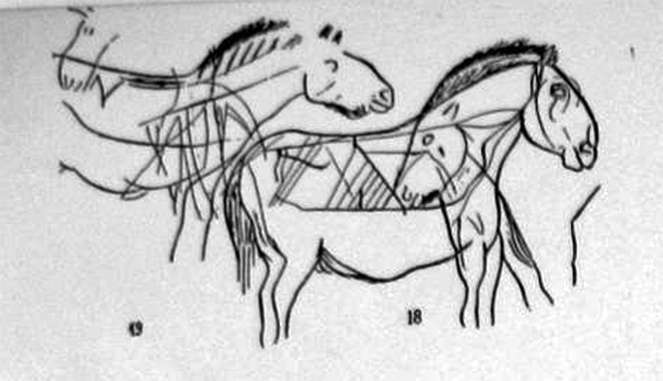 Below is an important paper by Breuil and Capitan from 1902, in which they report some signs of domestication of horses in the Magdalenian. In September 1902 we recognised on the walls of Les Combarelles 109 perfectly distinct figures, representing a series of engraved animals of various species, the entire animal or just the head alone. 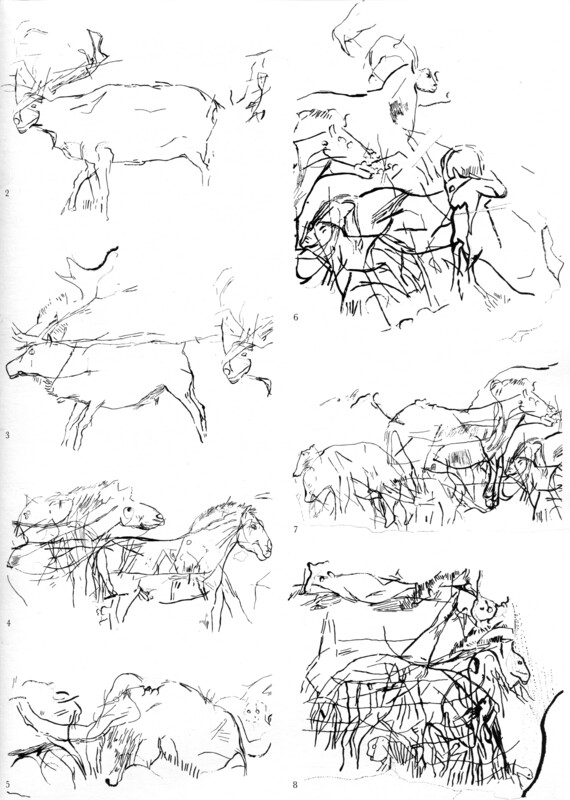 We have represented all these animals on a strip which measures 12 metres long and 12 centimetres high, at about one tenth of the natural size, and we place these here for the eyes of the Academy, as well as 27 tracings of the principal figures. 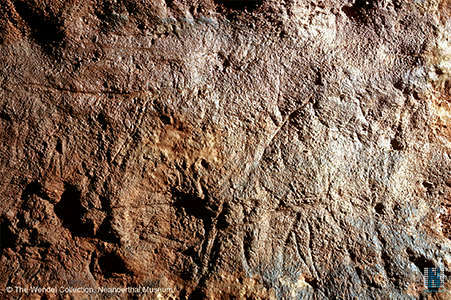 These images engraved on the walls begin at 125 metres from the entrance. The cave has the shape of a long winding corridor, with a height of 50 centimetres to two metres, and a width of 1 to 2 metres. 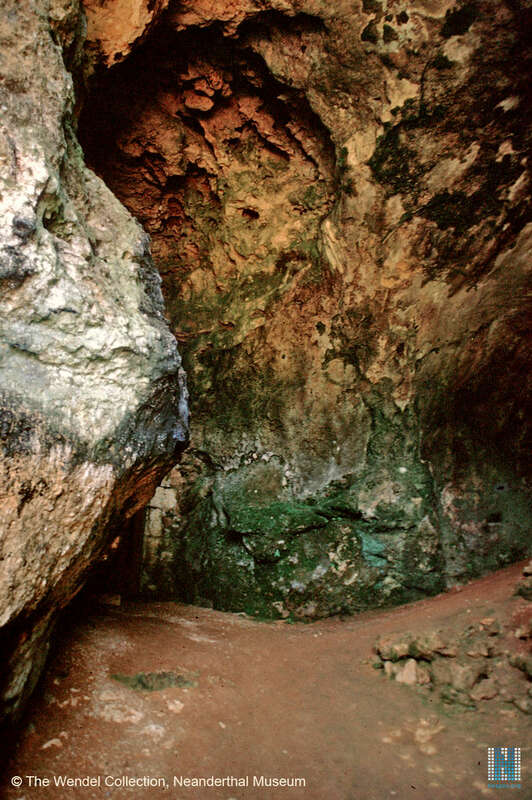 They extend over a length of 100 meters on each side of the cave, almost to the end, which is 235 meters from the entrance. 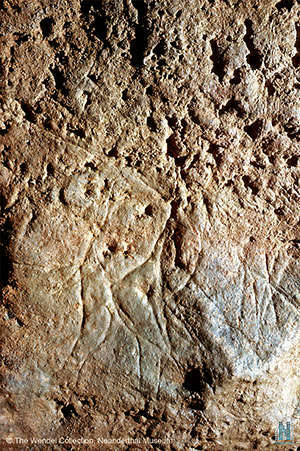 Engraved sometimes deeply (4-5 mm) In the Cretaceous limestone, sometimes slightly more, sometimes enhanced with a stroke of black paint, these figures measure 25 centimetres to over a metre in length. Many are coated with a calcite coating measuring a few millimetres thick and acts as a glaze on the drawings, while in other points the calcite hides them completely. 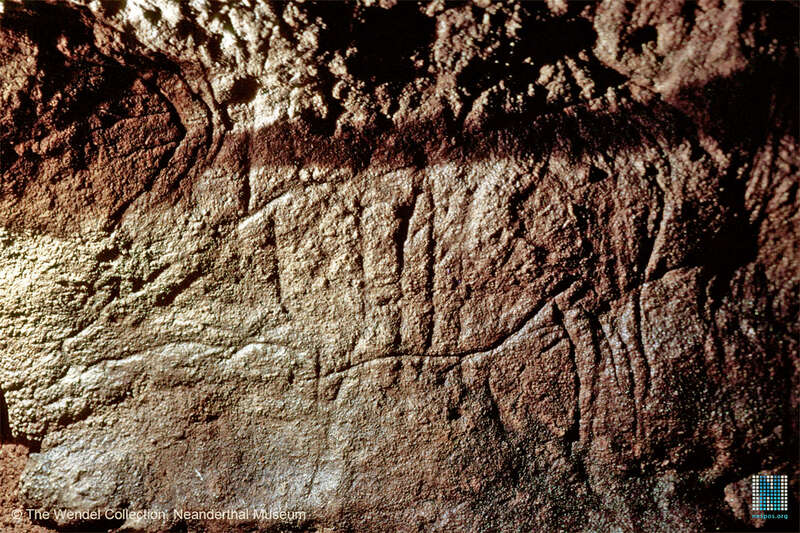 The animals represented as entire are horses, bovidae, bisons, ibex, reindeer, and mammoths, not to mention unidentified animals, various heads, and many drawings unable to be interpreted. 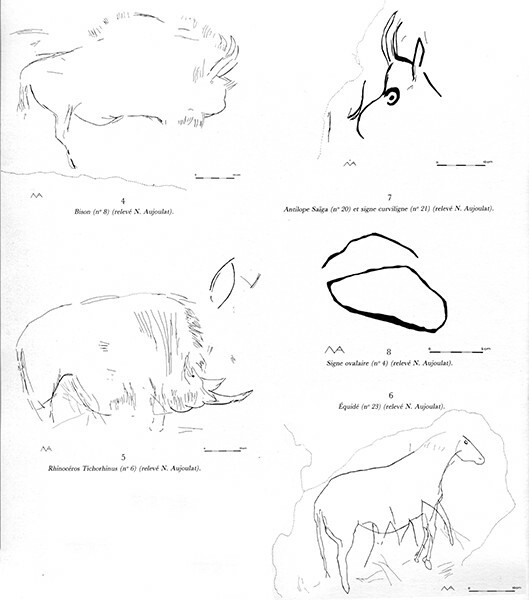 These drawings are always executed in profile, and show the animal at rest or walking, sometimes running. 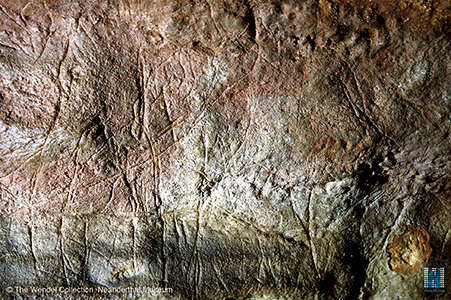 Their technique is identical to that of engraved bone or ivory found in deposits from the Magdalenian period. They have a character of precision and skill, showing the constant concern to reproduce nature as it is, with no idea of stylisation. As for the engraved bones, it appears evident that the figures have been executed by the artists of the time as exact replicas of what they saw. 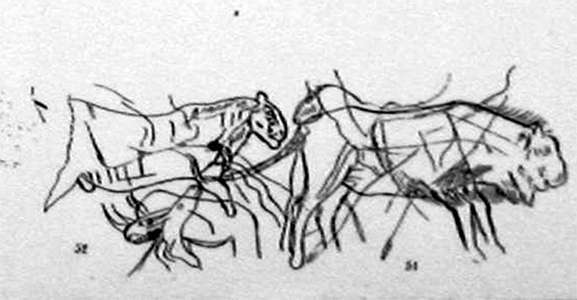 The horses have variable characters; some are reminiscent of the appearance of a mule, others are similar to modern horses, as may be seen on the copies we have presented here. The bovids are equally varied, one in particular with its large dewlap, his little head and his quite thin body. 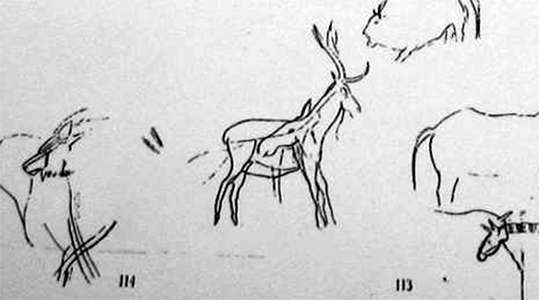 Two reindeer above, which we present also as tracings are figures with a fidelity that can leave no doubt about their identification. 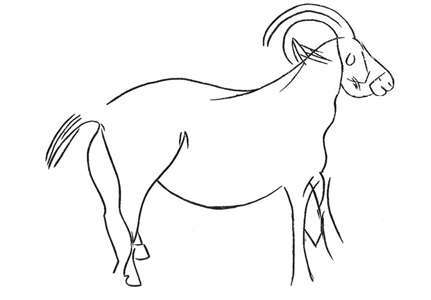 Two superimposed ibex have been very exactly reproduced. 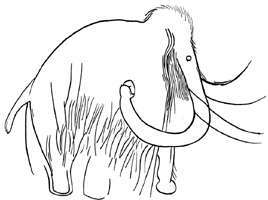 Finally, 14 figures show a variety of mammoths showing animals sometimes young and entirely covered with hair, sometimes older, and with less hair. All these images are of remarkable accuracy. Forehead, long hair, shape of the ears, trunk, legs, attitude, everything is represented with a special care that leaves no doubt as to the veracity of the identifications. 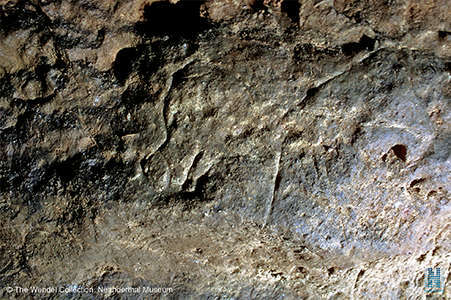 Four images of horses showed markings indicating clearly that the animals had been domesticated. Two had a covering on the back clearly shown, another presents a kind of band around the snout and a fourth has an indication evident on the cheek, a piece of reindeer horn, pierced with holes, formerly known as a baton de commandement, and that Piette has shown was a kind of primitive bridle. 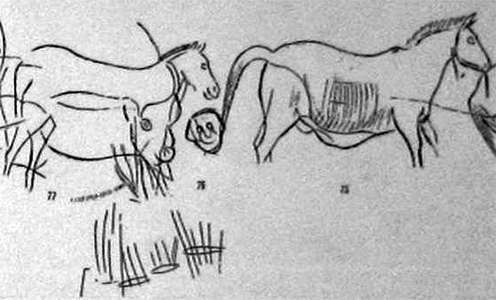 On the side of one horse, there is a diamond-shaped sign, circumscribed by two strokes; on the rump of another animal, we can see three signs that have the appearance of letters. 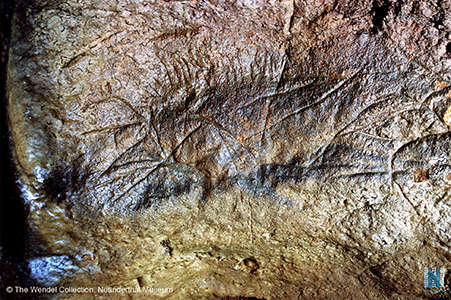 This arrangement recalls the letters that are, on the same area, depicted on some archaic Greek depictions of horses. 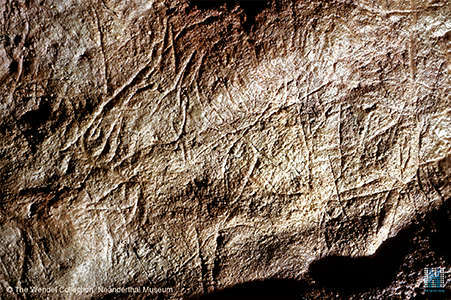 Other noteworthy figures include two signs in the form of brackets inclined towards each other and are deeply engraved and behind a large very precise representation of a mammoth. 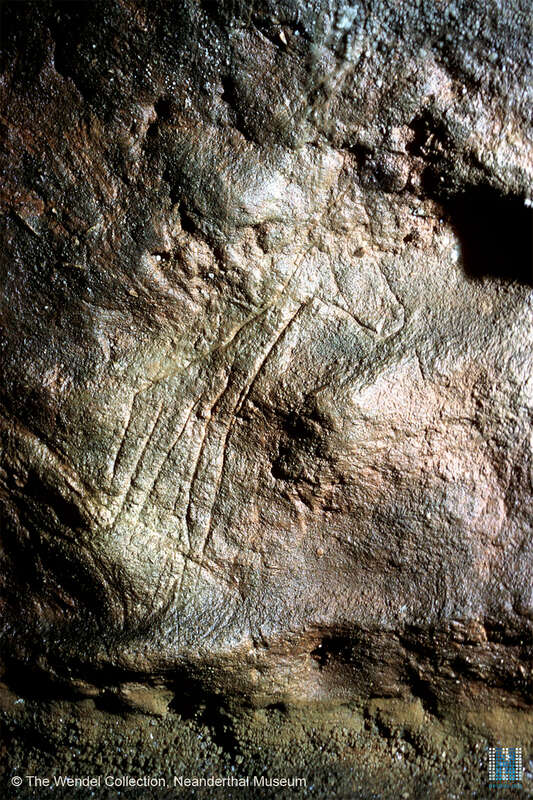 These signs are very similar to those that Piette noted on engraved bones he considered as representing a signature by the artist or a mark of ownership. The question of authenticity of these figures can not be within the shadow of a doubt. 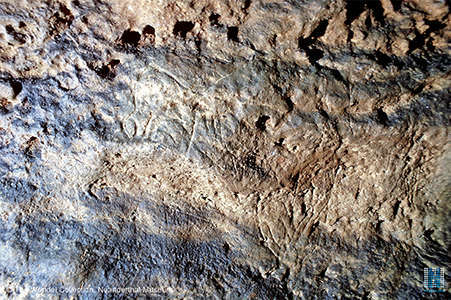 Their technique and way of reproducing animals already allows us to consider them very old, undeniably contemporary with the engravings on bones found near hearths for which the stratigraphy and fauna can be dated exactly and point to a bygone "era of carving" referred to by Piette or the Magdalenian referred to by G. Mortillet. 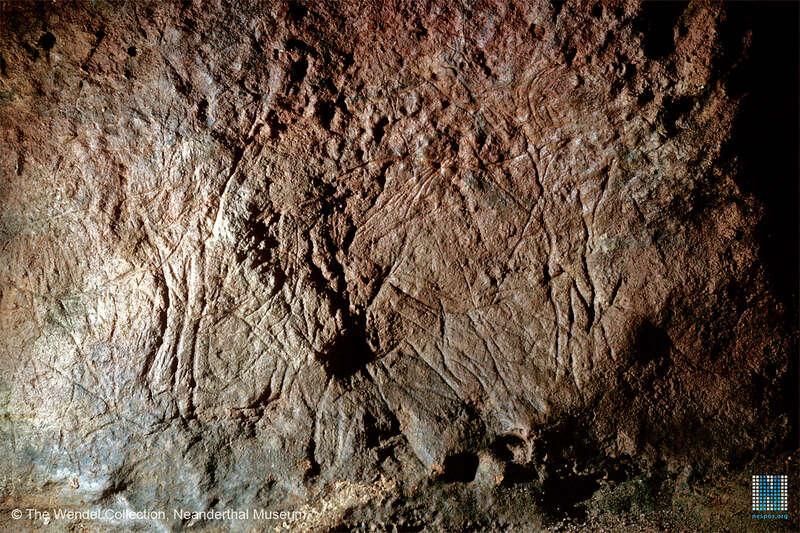 Moreover, the accuracy of the figures speaks clearly to the fact that they had to be executed by artists who saw the beasts they represented, and lived with them. Since these animals, the ibex and reindeer, disappeared from our land at the end of the late Magdalenian, while the mammoth disappeared probably even before the end of that period, it follows that these representations date from this period whose antiquity not able to be evaluated exactly, even in centuries, but only very roughly, and if we really wanted to have the figures they could be traced back to 10th or 12th millennium before our era and possibly even more remote than that. These multiple manifestations of a precise art, sincere, true, equipped with a learned technique are all the more remarkable in that they appeared suddenly, already very sophisticated, and they disappear no less suddenly, without going through a period of decadence. There is then no more sign of them in subsequent epochs, and apart from a few stylised or symbolic examples here and there, they have disappeared. 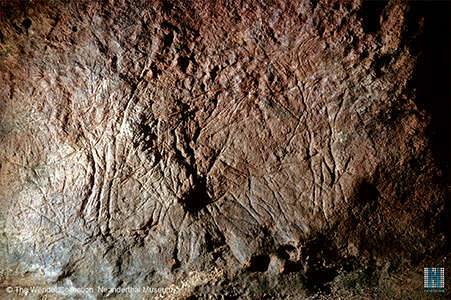 The study of prehistoric art events on the walls of caves give therefore a view of a history of the origins of art. This is of such great importance that we deemed it necessary to present this report of the results of our initial investigations to the Academy. Adapted from Leroi-Gourhan (1984), part of a chapter written and illustrated by Norbert Aujoulat. 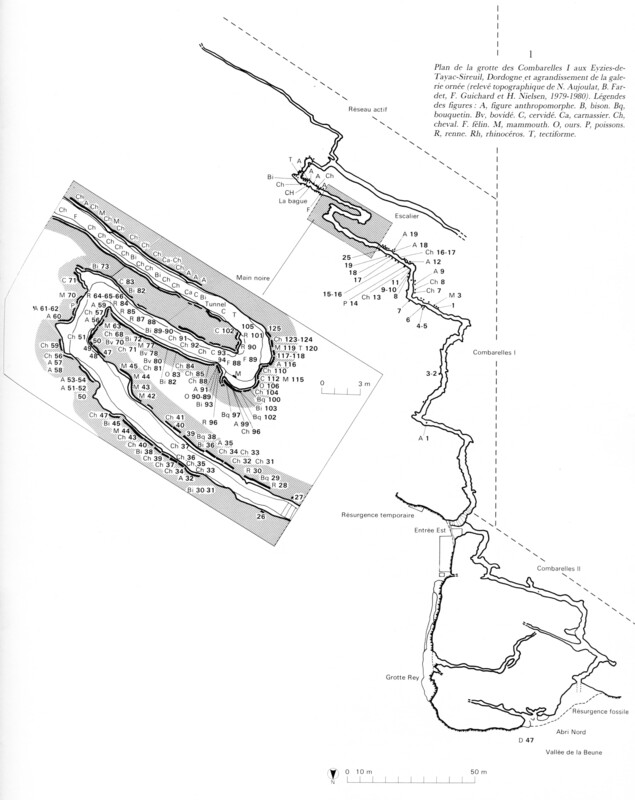 The plan of Les Combarelles II at left is by N. Aujoulat and H. Nielsen. Les Combarelles II is no longer open to the public. As we enter the porch, Les Combarelles I is to the left, and Les Combarelles II is to the right. The tunnels are similar in general character. 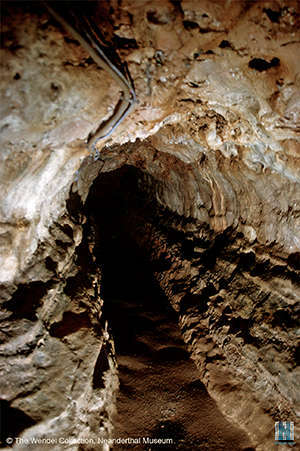 For Les Combarelles II, there is a winding profile, with a slope of 8 metres over the 103 metres of the cavity. The cavity can be split into three sections, of substantially equal length. 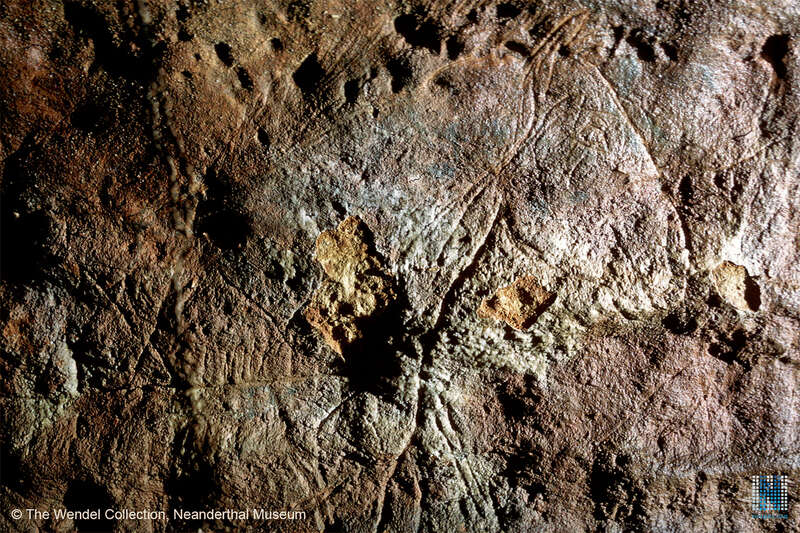 The first, of 35 metres, is very winding, and was the site of extensive excavations by E. Rivière. 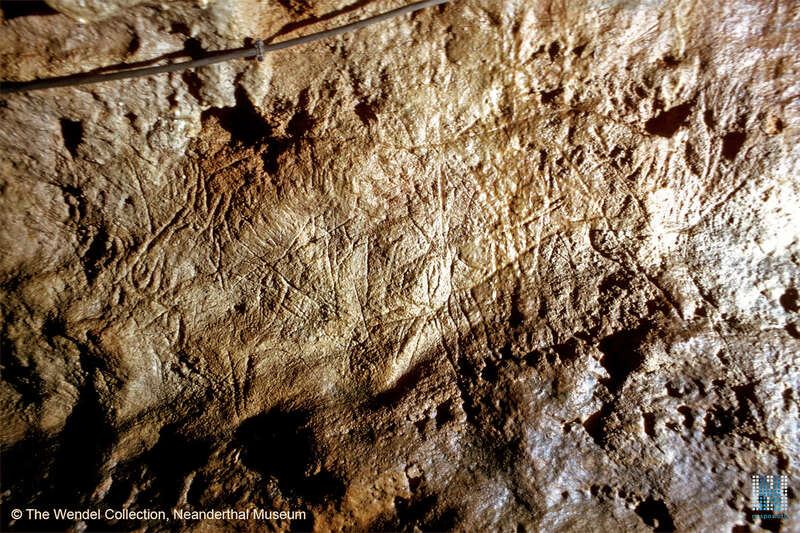 The second, of 36 metres in length, has a rectilinear layout, and includes all the known engravings of this cave. 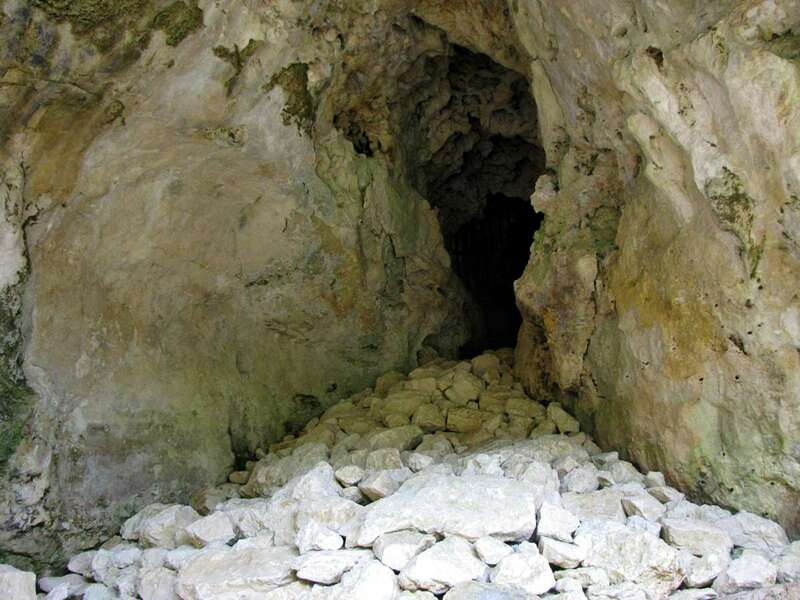 A stalagmitic curtain obscured eastern access at the southern end of the two ended tunnel, near the present entrance to Les Combarelles I; a sandy-clay deposit clogged the western entrance towards the north of the tunnel, thus sealing, before the intervention of A. Pomarel, the two potential entrances to this cave. The last 33 m is distinguished by its multiple floors and its numerous side chambers. 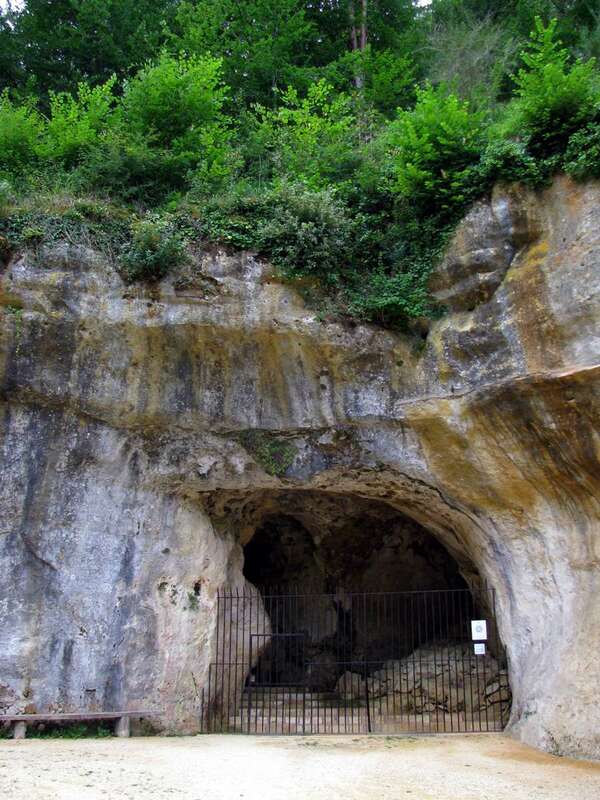 This cave makes the hydrogeological junction between the valley of Les Combarelles and the valley of the Beune. Its entrance stands at the bottom of a large abri, facing the departmental road D47. 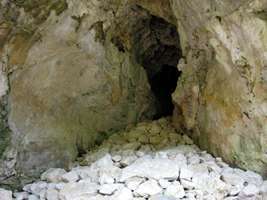 Originally, a large amount of fill clogged the entrance vestibule and partially obstructed the first thirty metres of this cavity. At an unknown time, this soil level was lowered to facilitate the establishment of a barn, under the porch. 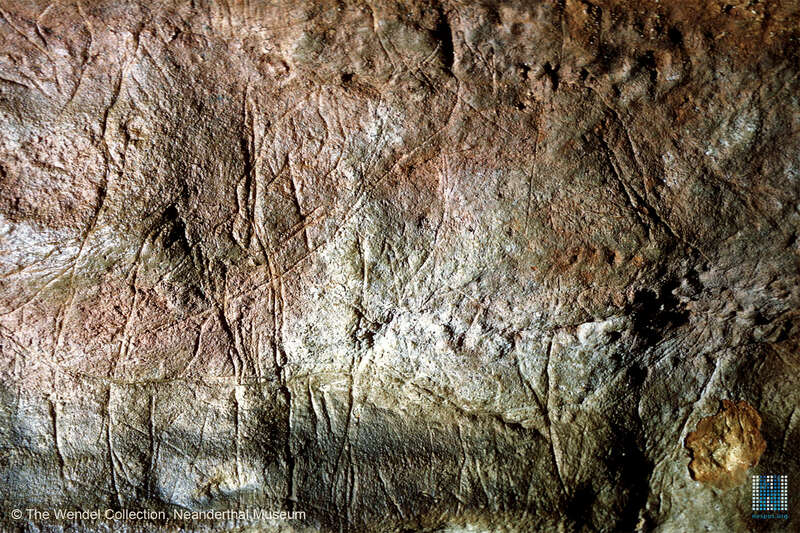 At the end of the last century, when E. Rivière undertook the excavation of the archaeological deposit of the right branch of Combarelles, it had been the subject of earlier research by Abbé Chastaing. 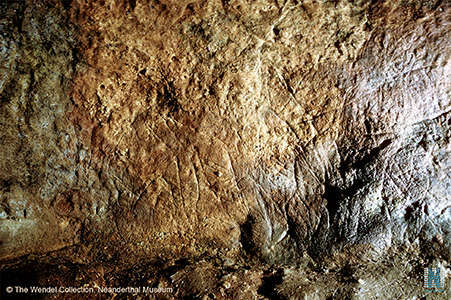 A sondage indicated to the latter the presence of a very rich Magdalenian level. 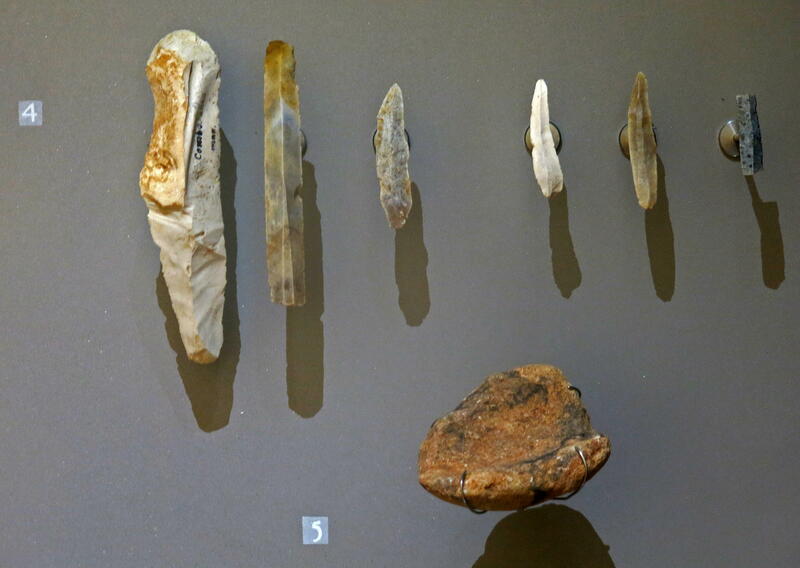 During a meeting of the French Association for the Advancement of Science (August 11, 1894), E. Rivière reported on the results obtained during the campaigns from 1892 to 1894: 'We found a considerable quantity of cut flints which were in the thousands. two bone harpoons, one with a row of barbs, the other with two; needles, awls, spear heads with large bevels, pierced teeth and shells, engraved bones ... ' (Rivière, 1894). Although these objects have no stratigraphic identity, their belonging to a Magdalenian culture is attested in particular by a harpoon with double row of barbs (upper Magdalenian), and a bone rondelle, with two holes, decorated with radial incisions (Middle Magdalenian). Entrance to Les Combarelles II. 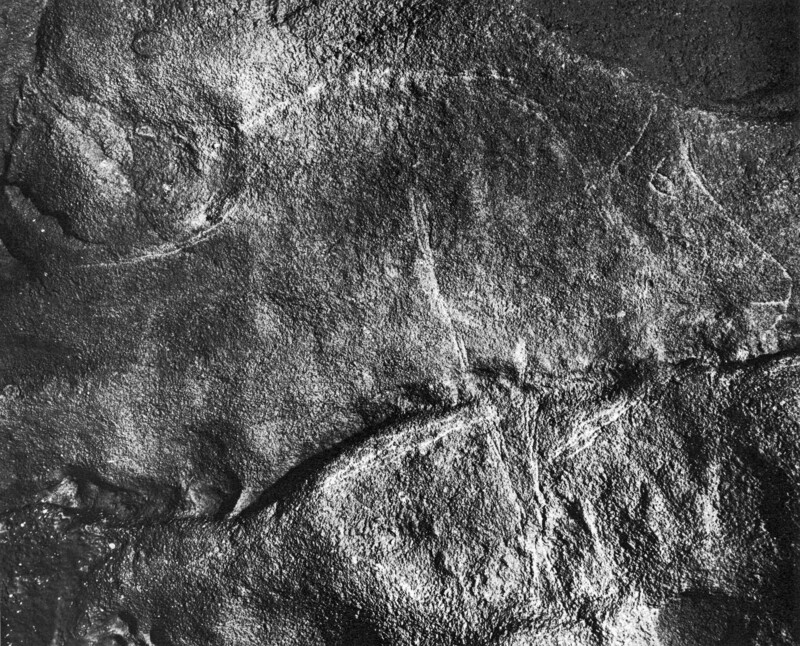 Probably taking into account these observations, A. Pomarel, in 1934, opened, through a filling of ossiferous breccia and clay, a passage giving him access to the decorated gallery. 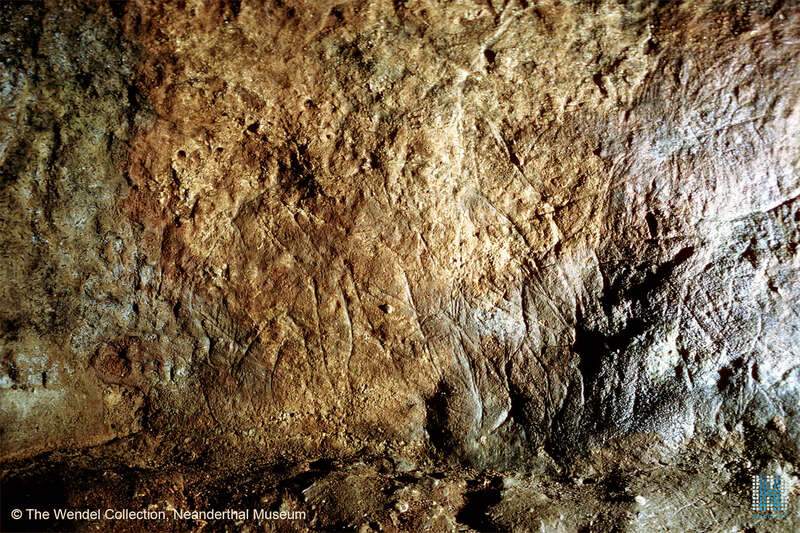 The careful observation of the walls led him to discover the first engravings of the cave. They were authenticated shortly thereafter by D. Peyrony, then partially recorded and published in 1952 by Abbé H. Breuil. 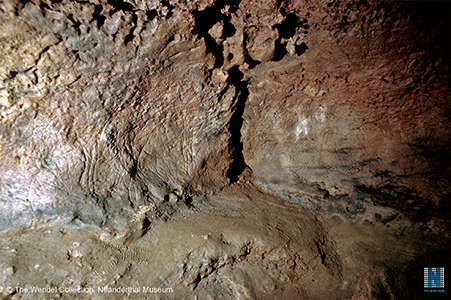 Before its excavation, the corridor of linear axis was barred in its median part by a stalagmitic flow. The first engravings appear one metre from this bottleneck, initially difficult to cross. They are distributed on the left and right walls, on the vault, and inside a chimney. The description of the figures will be in this order. 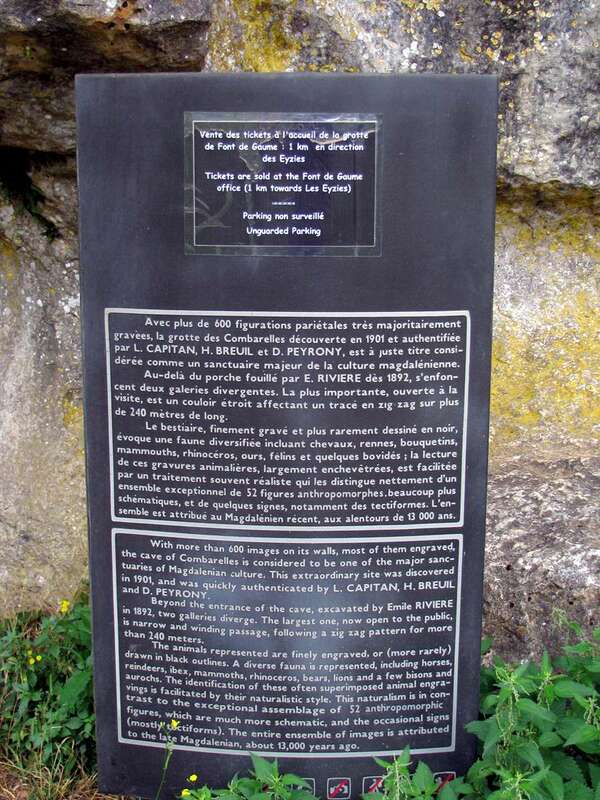 The reference point, or zero point of the planimetric positioning of the works, is located downstream of the end of the concretion. 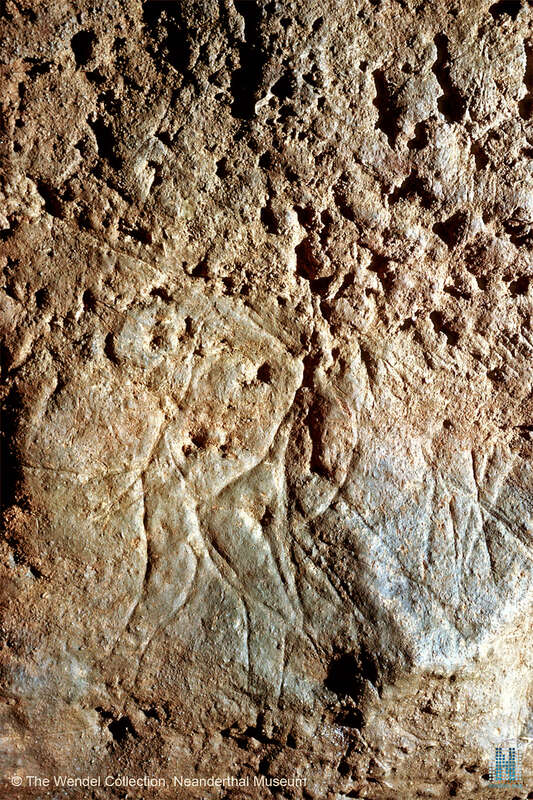 • Four metres further on, two engraved panels, with uninterpretable tracings, put an end to the decoration of this wall (16-17). 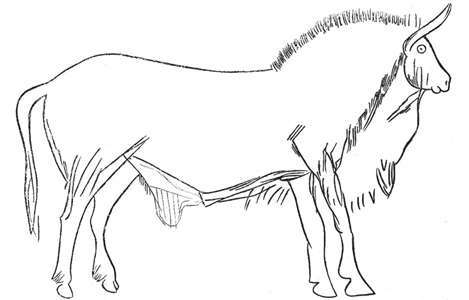 • At fifty centimetres further on, a horse with a static rear hoof, a raised front hoof, and with a 'goose rump' or 'jumping rump' (a rump which inclines sharply downwards, the slope of the pelvis being significantly greater than 30 degrees with the horizon) (Fig. 6) (23). 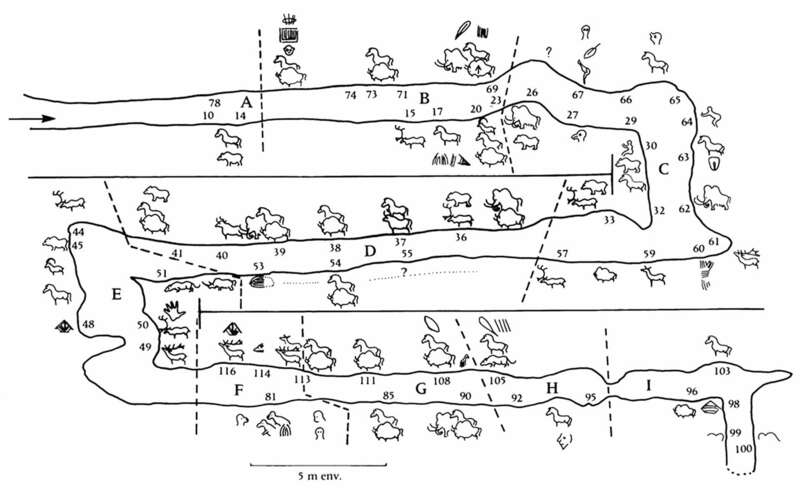 The sequence on the right ends on an indeterminate figure, at sixteen metres seventy cm (a ruminant according to Breuil) (24). Two engravings adorn the ceiling of the gallery, one located at fifteen metres forty cm, the other at seventeen metres thirty cm. 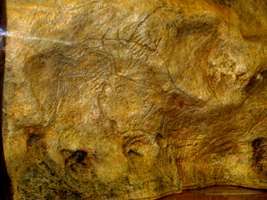 The first is similar to a bison head traced on a rocky outcrop whose ridge marks the edge; only the eyes and horns have been incised (25). 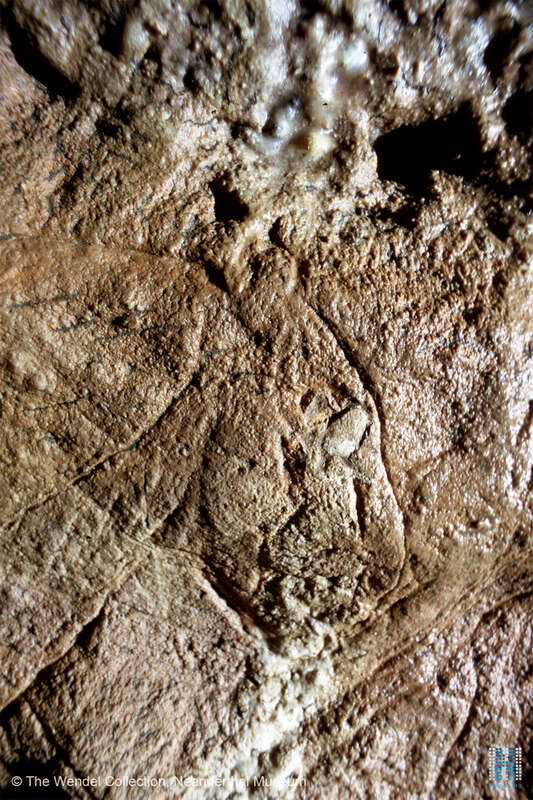 The second, inserted inside a concavity, could be identified as a mammoth (26). 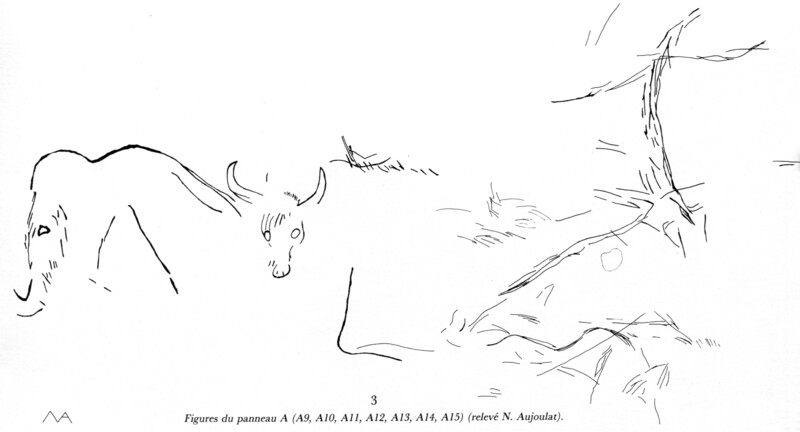 At the level of the rhino-bison pair, a subvertical chimney was decorated with three bisons (27-28-29) (Figure 1). Turned to the right, they occupy the corners of an imaginary triangle, the point of which is directed downwards. A sign comparable to a tectiforme precedes the juxtaposed bovines (30). Inside the outline of the bison adjoining this figure is the head and neck of a horse (31). 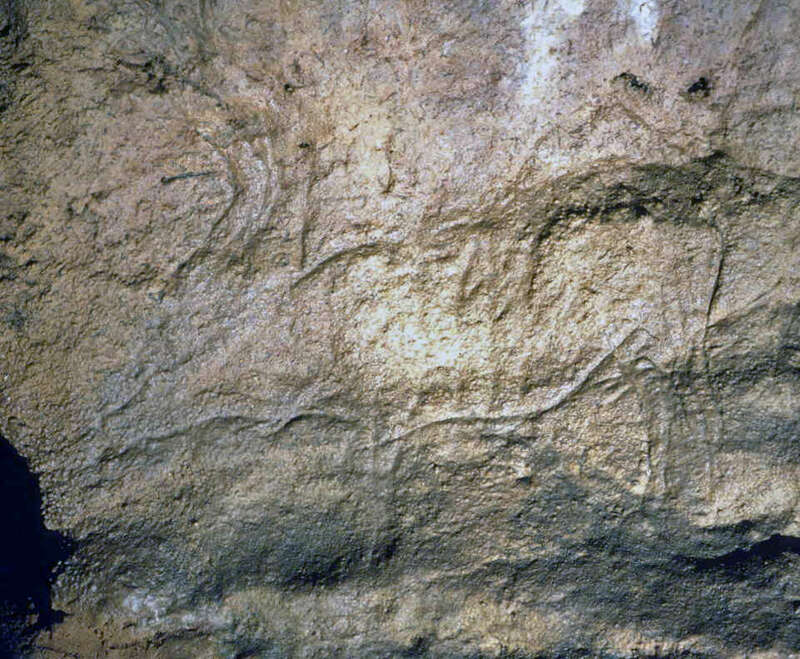 On the opposite wall, a second sketched equine (32) (rump) complete the decoration of this chimney. The current layout of this vertical duct did not allow us to confirm the identity of a figure placed at a high level (10 metres), which could be a mammoth (33). The commercial exploitation of a cave inevitably and irreparably affects graphic wall representations. These degradations occur during successive developments, visits, or when the site is abandoned. Les Combarelles II has undergone these three phases. 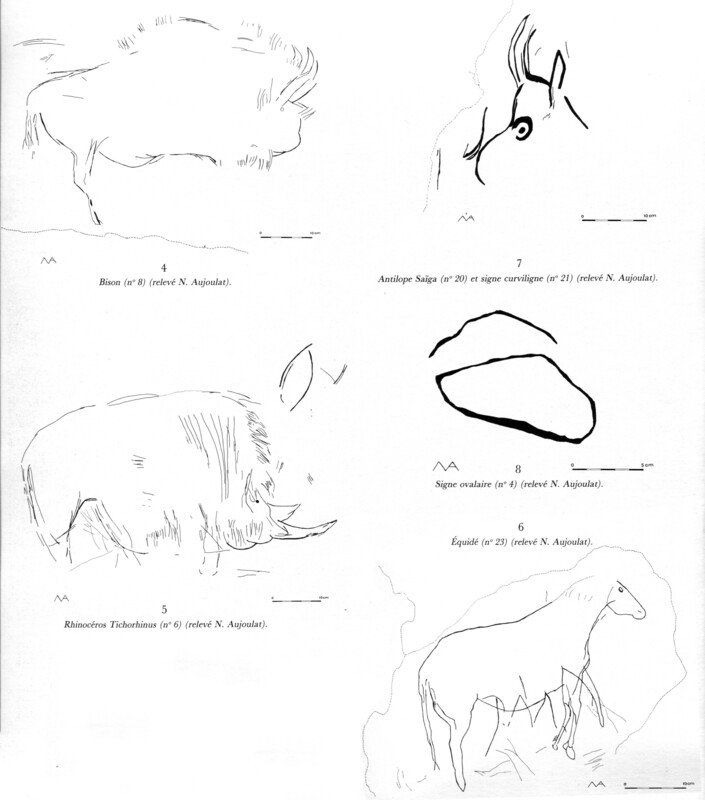 Although the opening to the public was episodic and the groups formed in each case were small, the fact remains that the rubbing of clothes on the walls has greatly altered certain areas more exposed than others, especially the Rhino-Bison pair. It was threatened by the very sensitive action of a current of air caused by the removal of the filling at the two ends of the decorated corridor. An effective closure has recreated the initial and ideal conditions for conservation. Capitan L., Breuil H., 1902a, Figures préhistoriques de la grotte des Combarelles (Dordogne). Comptes-rendus des séances de l'année.. - Académie des inscriptions et belles-lettres, 46e année, N. 1, 1902. pp. 51-56..
Capitan L., Breuil H., 1902b, Gravures paléolithiques sur les parois de la grotte des Combarelles près des Eyzies (Dordogne) Bulletins de la Société d'anthropologie de Paris, V Série, tome 3, 1902. pp. 527-535. Capitan L., Breuil H., Peyrony D., 1924, Les Combarelles aux Eyzies (Dordogne), Paris, Masson, 1924, 192 p., 128 fig. (Archives de l' Institut de Paléontologie humaine). 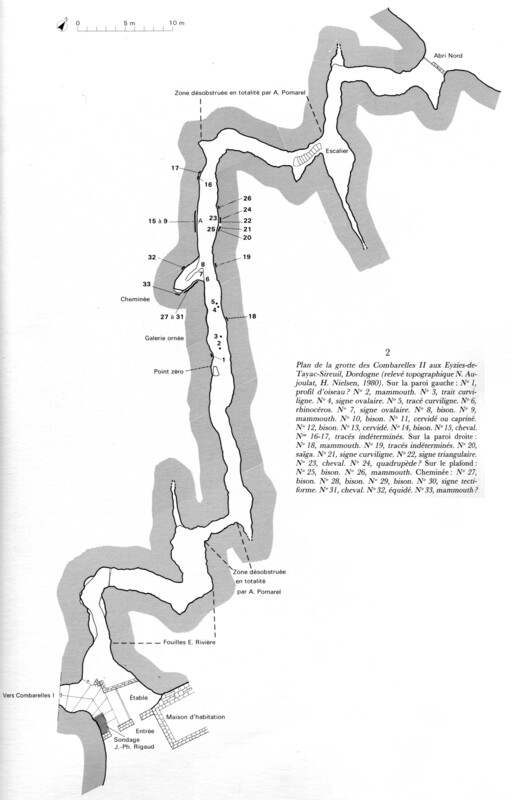 Rivière E., 1894, Nouvelles recherches anthropologiques et paléontologiques dans la Dordogne, Association française pour l'Avancement des Sciences, 23e Congrès, 1894, Caen, t. 2, p. 709-722, 6 fig. , 1 pl. This file is licensed under the Creative Commons Attribution-Share Alike 1.0, 2.0, 2.5 Generic license and the Creative Commons Attribution-Share Alike 3.0 Unported license.